From Duck Soup to Quark Soup: Is the Large Hadron Collider a good idea? ... and all sorts of other stuff! 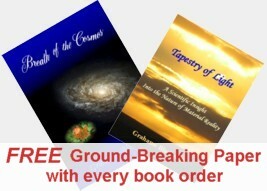 Breath of the Cosmos: The physics of material reality as never before - in beautiful pictures and flowing poetry. Tapestry of Light: A radically new, but ages old, perspective on the nature of material reality. A layman's view of the scientific issues. "I read 'Tapestry of Light' on my flight to Washington, D.C. – I was stunned! I proceeded to read 'Breath of the Cosmos' the day after I got back. 'Tapestry' deserves a Nobel prize in physics and 'Breath' a Nobel prize in literature. Your energy flow paradigm makes total sense to me. As you show, it explains all of Einstein's findings but also explains the arrow of time. Lloyd Morgan, Director, Central Brain Tumor Registry of the United States. "I thought your talk at the London College of Spirituality 2012 Forum was absolutely fantastic - interesting, funny, massively informative and you made some complex science very acces-sible. Your books have been on my to-buy list since then, how wonderful that they are now on their way. I really look forward to reading them." Dee Apolline, The Big Chi, London. 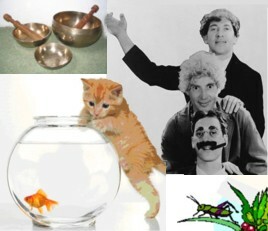 Here you'll find everything from the Marx Brothers to singing bowls, from grasshoppers to goldfish - and much, much more - all in the name of science. "The perfect balance of new science, humour & helpful info that people can relate to in their lives", "I am impressed! I found it easy to read, not boring at all! very interesting and have subscribed for more! ", "clear and precise, easy to read and acutely interesting. I like the user-friendly presentation. I have subscribed!" Subscribe free for notifications of new postings. Transfinite Mind offers consultancy services to groups and organisations (or individuals) wishing to pursue the potential benefits of the new perspective. These services are tailored to the background and requirements of the organisation and those within that body responsible for liaising with us. Areas of interest may be as diverse as: specific lines of potential technological development; possible implications for the future (general or in respect of particular issues); deeper implications of these new findings. To discuss requirements for your organisation, email us here. The scientific concepts presented here are not difficult to understand but they can be made considerably more meaningful with a bit of explanation. This applies particularly when the application of those concepts to specific areas of science, or to specific aspects of 'everyday living' (communications, transport, energy sources etc) is of particular interest. Further clarification of these concepts can be provided as required with regard to their applicability to such areas. To discuss your requirements and area(s) of interest, email us here. The scientific mind, and scientific method, has particular requirements of any new concept or discovery. In particular it's likely that explanation will be required as to how this new perspective dovetails in with existing scientific knowledge as well as any ways in which it sheds new light on that existing knowledge. Possible avenues of further scientific development are also likely to be of considerable interest. To discuss your specific scientific requirements, email us here. A major strength of this new perspective on reality is that it's not so mathematically or scientifically complex as to be inaccessible to the non-scientist. On the contrary, there is much about this new view that non-scientists will find both familiar and easy to get to grips with. We would be glad to acquaint non-scientists with features of this new scientific paradigm and clarify any details that are of particular interest. To discuss your specific requirements, email us here. A major aim of Transfinite Mind is to stimulate and extend research in the wide field opened up by this new perspective on material reality. Whilst initial research activity will necessarily be of the kind generally termed 'blue sky' it is anticipated that areas of application could prove to be very extensive. Proposals are invited for specific research activities, to be funded by the proposer. To discuss your specific research plans, email us here.